For all enthusiastic Bollywood fans, get this Priyanka Chopra IIFA award"s designer butterfly golden net Bollywood replica saree which comes with the unique design sequins and embroidery work along with a Red velvet zari worked border which gives you grace and completes your wardrobe with excellence. The saree accompanies a matching blouse piece as shown along with free petticoat material. So go Bollywood style. Shop this Priyanka Chopra designer saree at the best price. 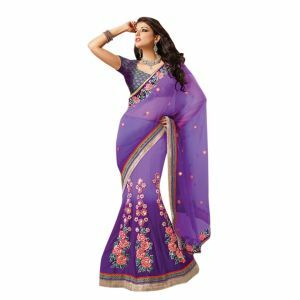 This elegant saree will add a lot of grace and poise to your personality. Drape it when you are going to a kitty party or to meet your ladies and show your unique sense of style.